Imagine a place that’s far removed from the congestion, pollution, and sprawl that so often mar our landscapes, a place where sun-dappled country roads meander through a charming little town. Imagine a time long ago when life wasn’t some harried, noisy hubbub—when there were enough hours in the day after tasks were done for merrymaking and little adventures. Imagine that you could instantly visit this place and time whenever you wanted, and stay as long as you wished, lingering in its cheery quaintness. Escape to a Prettier Past. The story revolves around seven orphan girls living in the Victorian era. Their home is an orphanage in the cozy town of Amber Fields. Just a little ways away is a peaceful spot in the woods known as Ginger Brook Hollow—and yes, plenty of ginger grows along the brook, perfect for turning into gingersnap cookies. In an idyllic yellow house in Ginger Brook Hollow lives Grandma Sunday. (The orphans gave her this cute nickname because they visit her every Sunday.) “She is the character that is the heart of Ginger Brook Hollow,” says Maude. As Maude tells it, all the elements of Ginger Brook Hollow came together organically. The setting “probably came from my childhood,” says Maude. When she was 10, her family moved to the country, and she relished the freedom to roam and play in nature. And she loved reading about the Victorian period, from Little Women to Anne of Green Gables. A doll collector and doll company consultant and developer as well as a former teacher and writer, Maude spent a year researching her concept, and it would be another two years to get the dolls and other elements of their story ready. She went through numerous sculpts before realizing the perfect design. Professional sculptor Erasmo Fuentes individualized the faces. 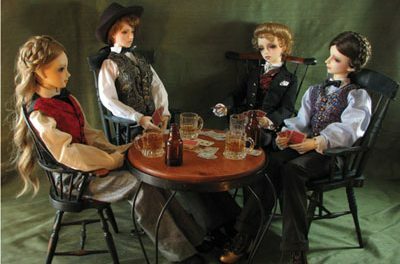 “The dolls are done according to their personalities,” Maude notes. Here’s a look at the Ginger Brook Hollow family. 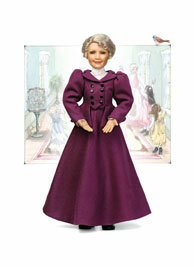 Dolls include 17-inch vinyl character dolls based on all seven orphans ($170 each) and a 22-inch Grandma Sunday ($300). Each doll has nine ball joints, making them extremely poseable. 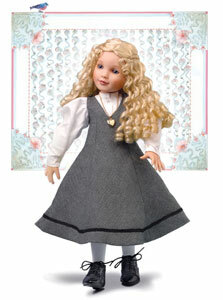 8-inch travel dolls, perfect for smaller spaces. 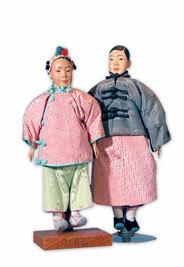 Billed as “Dream Dolls,” they portray the dreams that the or­phans have for their lives when they grow up ($70 each). The orphans wear the same three-piece uniform—with white underdress and gray jumper. Grandma sports details including a lace chemise under her corset. 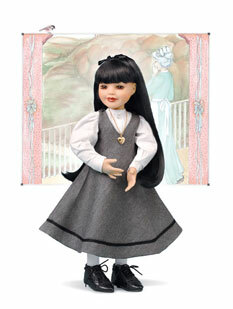 Additional outfits and accessories, such as shoes, nightclothes, a vanity set, bedding, and a bed (which includes a trunk where the dolls’ accessories can be kept) can be purchased. Each doll comes with a “teeny little story” book that’s just about her. Maude says that books sold with dolls often go unread, so she plan­ned these stories as small snapshots of the character that are designed to be read quickly. Paper dolls also come with the character books. According to Maude, the paper dolls are an especially good fit for people who aren’t quite ready for a high-end collectible doll but still want to experience the story. Rounding out the line is the picture book Where Love’s Circle Begins: A Ginger Brook Hollow Story. Illustrated with watercolor paintings, the book is first in a series about Grandma Sunday and the orphans. “Anything I can do to inspire a relationship with learning and make the dolls more interesting, I’m for that,” Maude says. A Touch of Evil: Disney debuts a lineup of designer villains that are gorgeous and ghastly!